Day 3 had doing a loop ride out of Rocamadour and then right back to stay at the same hotel as day 2. The weather and the riding on the routes in this area were again fantastic and especially in the morning. 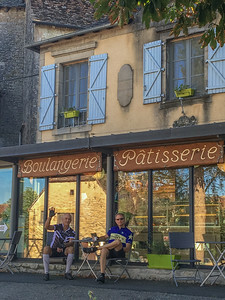 The photo at the boulangerie (bakery) was a particularly fun little stop in the morning. Nothing fancy, just some good coffee and a croissant. That’s Jim on the left there, me on the right. By mid day we had arrived at a planned activity for the day and that was a visit to Gouffre de Padirac. Quite touristy but also actually pretty cool – quite literally. You descend into this giant hole in the ground to find some spectacular caverns and an underground river. And, it was much cooler down there than up top so I was glad that we had been given a heads up to bring something more to wear. I was also glad to not be in cycling shoes down there. It’s wet, its slippery and you actually do quite a bit of walking up and down stairs. You’re prohibited from taking photos while on the tour (though that has to be hard to police and I saw more than 1 tourist being admonished) so consequently I don’t have any to post here. I would suggest instead you check out the official website. 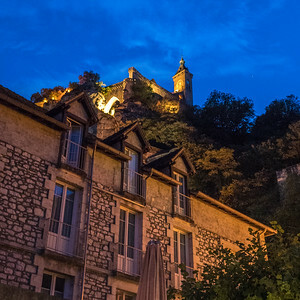 The darker evening photo was taken from our terrace dinner location back in Rocamadour. Rocamadour is pretty small. There where other restaurant options but many of us – based on recommendation – opted to eat again at the same terrace restaurant we had been at the night before. Food was again good – I got the duck. The most enjoyable part though was simply being able to dine outdoors in what amounted to room temperature. It was really perfect weather to be outdoors in the evening. I’d be remiss while I jot notes about Rocamadour if I didn’t also mention the cheese I ate at every opportunity while visiting. I’d never actually heard of it before the visit but the 1st night it was served as part of the dessert courses and then I noticed it was available (along with some meats/cheese) at breakfast the next morning. It was rather aptly named Rocamadour Cheese and was a little goat cheese served in a small flat and round shape. I’ll look for it around here in Austin but I don’t expect to find it. I did, however, find it in other nearby towns. In fact, I bought some more in the town of Sarlat, which would be our next destination. One last photo. This one was taken from my hotel room window just about sunrise as we prepared to head out and ride to our next destination. Day 2 had us heading off from Brive to the little village of Rocamadour. 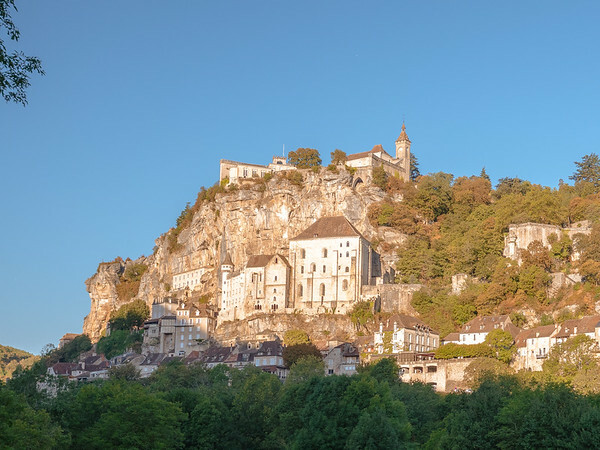 Check out the link to read more about Rocamadour but as you can see from the photo it’s a beautiful little town tucked into the limestone cliffs. As you can also see, the weather we had that day was spectacular. Warm but not hot – at least by Texas standards for the time of year. The route from Brive to Rocamadour was in my opinion outstanding. While there’s undoubtedly some troublesome traffic to endure as you leave the center of Brive, once you’re out on the rural roads it was quiet, quaint, rolling and picturesque. Not far out of Brive we had a pre-arranged visit planned at a little farm and bakery. Had this not been pre-arranged it would have been very easy to simply roll by just another farm. 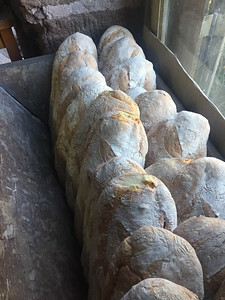 But having pulled in, we were directed into a little barn and inside was the owner of the farm/bakery was a big wood fired oven and a whole lot of loaves of bread and bread-making equipment. He was also in the midst of making more bread with plenty of doughy goodness ready to be stuffed in the oven. You can see a photo here of some of the loaves in a big bin. The best part of course was sampling the fresh bread! 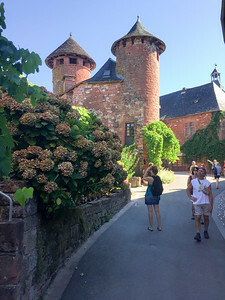 After leaving the bread behind and what seemed like a relatively short ride on our route we passed through another pretty little town named Collonges-la-Rouge. The town is clearly mostly a tourist attraction at this point but it’s beautiful. I didn’t take a lot of photos here but you can see one I’ve included. The town was built entirely of red sandstone bricks. Had I arrived post the noon hour I would have been inclined to stop for lunch at what looked like some interesting little places. I was a little too early though so I kept on. Our route that day was 47-something miles and the afternoon presented both some warmer temps and some hill climbs. Challenging enough but the grades were not that bad and the roads were quiet. It was an outstanding route into Rocamadour. Rocamadour consisted of pretty much one main street at the base of the cliff. Along the street were mostly shops and restaurants and hotels. It definitely exists mainly as a tourist destination though I would say I didn’t find the touristy bits to be too overdone. In late August, we were told the crowds were much less than just a couple weeks before. Our hotel was right in the center of the town and conveniently had two highlights: the first was that it had a really inviting terrace/bar next to the hotel. It was shaded in the afternoon and afforded good people watching at the same time. Our crew of riders and guides gravitated to the terrace given the fantastic weather and tasty beverages. 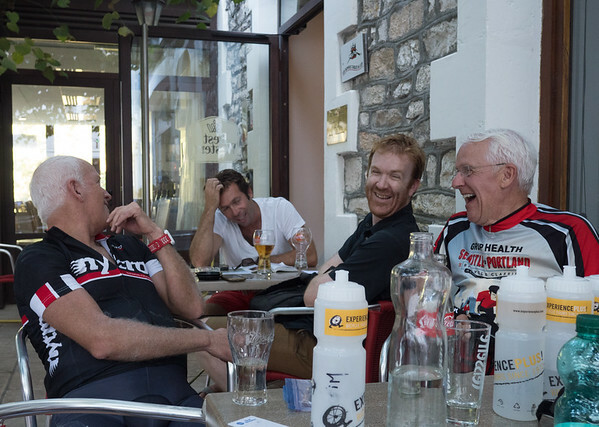 You can see a photo of some of the group laughing it up at the terrace bar post that 2nd day ride. Good times. The other good thing about the hotel turned out to be its restaurant. The food was excellent and it too had a terrace. Loved dining outdoors! Next day: a loop ride and right back to Rocamadour. 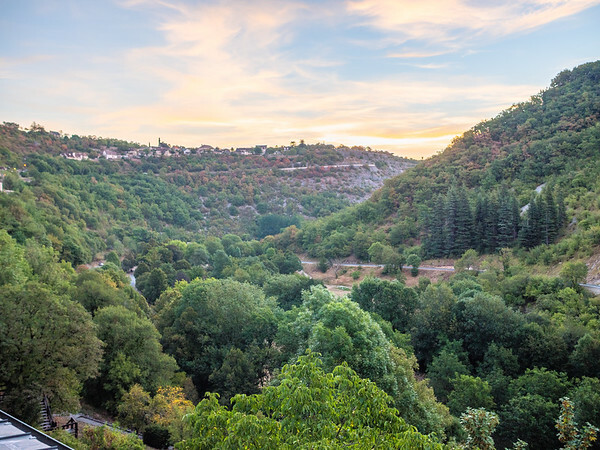 After my overnight at Le Petite Clos I headed for Brive and what would be the start of my bike tour down the Dordogne river valley. I arrived a day early knowing I typically take a couple of days to deal with jet lag. Brive seems like some other small cities I have visited in Europe in that it has something of a sprawling and modern outskirts and then a very small historical core center, often with one or more lovely old church or similar historic buildings. In my jet lagged stupor I mostly just walked and browsed the little side streets of the central core. 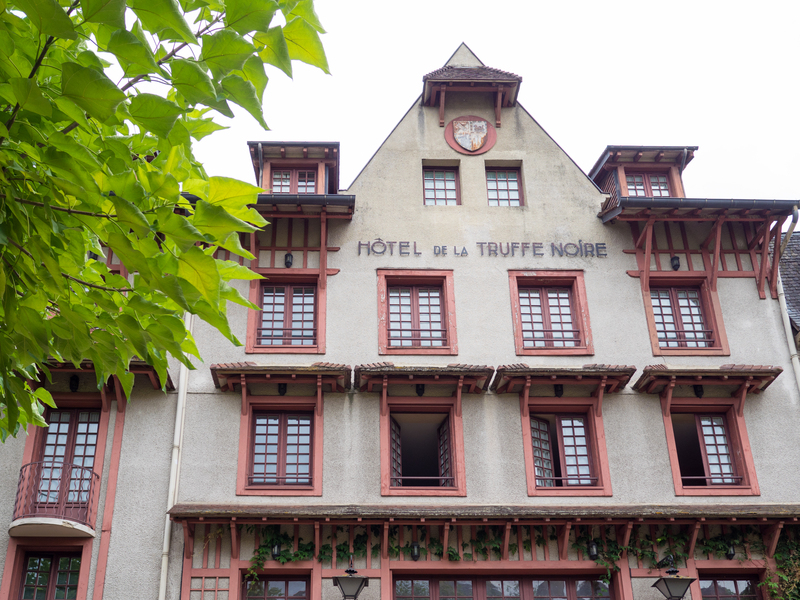 My hotel, the Truffe Noire, which you see pictured in this posting was essentially on the edge of the historical center. Other than it’s convenient location, the restaurant was the key feature that otherwise set the hotel apart. The food was good. The room was nothing special but then I didn’t spend much time there. You can see my room from the front of the hotel because it’s the one, again, with the window wide open. The weather was nice. The other photo below was the view out my window. The hotel was the meet-up point for the bike tour and even before the official metope time on my 2nd day at the hotel we started to meet one another. But we all got together officially at 2pm in biking gear to ready bikes and do our first short loop ride. Next up: we’re off to Rocamadour.